Buddy is being Buddy... a teenage puppy (14 months old) that tests me one day then wows me the next. Though he was gone for four months at Hupnow Gundogs,(Kurt did a awesome job!) it didn't take him long to re-bond to me - in fact he is very aloof and ignores other people unlike Scout who smiles and wiggles and wants everyone to pet her. Buddy only cares about me. I am his world (except when he is hunting!) and he is once again strongly bonded to me, which was a major fear of mine when I sent him out for training. Buddy is always with me, no matter where I go. He follows me from room to room in the house and sleeps next to my side of the bed at night rarely letting me out of his sight. He still even insists on getting in the shower with me each morning! Our training sessions are going well - some days are brilliant, while others are... well... just Buddy being Buddy. I have to keep reminding myself he is only a puppy. With Kurt's help, we are working through this and I'm trying hard to be calmer during training sessions, which is helping. I wanted to tell everyone what happened on the first Saturday of June. In the evening, I was working out in my garden while Buddy laid close by in the soft green grass sadly watching me - as he couldn't be inside the garden fence with me. He is, by the way, the best rototiller I have ever had! And Scout endlessly hunted within sight, like she always does. Scout was about 25 yards away sniffing in the trees, looking for squirrels, snowshoe hares... or whatever. Suddenly, Buddy jumped up and ran up on top of the mound near my garden. He stared intently into the thick alders and spruce on the lot next to ours. His hackles went up then he was growling and intermittently "woofing". There has been a very calm cow moose hanging around the yard for two weeks and I figured it was her in the brush. Buddy sometimes barks at her, but the day before she suddenly appeared out of the trees into the open and he went up and sniffed noses with her! Her ears stayed up and she showed no sign of aggression, but I called him and he came instantly. I got him into the dog yard as I don't want him anywhere near moose who can easily kill a dog with one kick. He then sat quietly in the dog yard and watched the moose as it grazed in the yard. The cow moose should have calved by now - if she is going to - then she will become protective. Anyway, I figured the cow was there in the brush so I called Buddy planning to put him in the dog yard, as I had the day before. Though he was only about ten feet away, he totally ignored my command to come... and kept staring into the brush... growling. I yelled my meanest "come!" and he still ignored me. Worried that he would go into the brush after the moose, I went over, grabbed his collar and led him to the dog yard, closing him inside the fence. I called Scout, who was still hunting (she showed no indication she might hear or smell the moose) and put her in the dog yard also. After the dogs were secured, I decided to go back and look in the brush to see if the moose had calved. The moose move into the neighborhood in droves this time of year to have their calves where they are away from predators. But it doesn't work; the predators just follow them into the neighborhoods, too. We've had seven moose calves that I know of born in our yard over the years - making live treacherous for a few days for us and the dogs as the cows become very aggressive protecting new calves. When I walked towards the brush to take a look, Buddy went ballistic leaping against the fence (he sure did not do this the day before when we repeated the same scenario) barking frantically - this set Scout off too. Dumb me, (always trust your dog!) I should have figured something was different as his behavior was totally different the day before when I approached the moose... but I went to look for the moose anyway and ignored Buddy's message. I looked in the thick brush, but couldn't see anything while Buddy still went absolutely crazy. I turned and yelled at him to settle down, then turned back... just in time to see a very large brown bear step out - a mere ten yards away from me! "You should never run from a bear. My heart was pounding in my ears as I managed to climb up the side of the deck. It went though my mind that if I can climb up the outside of our deck so can a bear!" What a shock! I have lived up in that valley for 15 years. I know we have an occasional brown bear, and know they come in this time of year looking for moose calves to eat but had not seen one for 10 years (we had a juvenile one summer that had to be shot). I was terrified, but fascinated at the same time as the bear did not so much as look at me - or the hysterical dogs. He just walked calmly through the yard towards my bird pens. He was a dark chocolate brown and was as tall as my hips. His muscles rippled under his hide and he had that distinctive rolling bear gait. His hind feet were huge and I could see the bottoms of his pads as he walked along! I felt helpless standing there in the middle of the yard with no shelter... and no gun. When he got to the bird pens, I moved quickly. You should never run from a bear. My heart was pounding in my ears as I managed to climb up the side of the deck. It went though my mind that if I can climb up the outside of our deck so can a bear! Then I ran into the house and got the shotgun I keep by the door this time of year. I knew that my first shot is a cracker shell - which goes out and explodes like a huge firecracker, designed to "educate bears" but not hurt them. Keith shot a black bear last year with a cracker shell and never saw him again! My next loads were buckshot... then slugs, designed to kill, if needed. By the time I got back out on the deck, the bear was in the brush again and I couldn't see him. I didn't hear any excitement at my bird pens - which I can only see one corner of from my deck. There were two pre-teen boys playing across the street doing what boys do: making tons of noise with sticks as swords whacking trees and letting off energy. The bear was heading right towards them so I yelled and told them I had just seen a big brown bear heading their way. They stopped, thanked me and ran for their house. I never did see the bear again and, thankfully, it left my birds alone. My theory is that it was looking for the cow and, hopefully, a new calf to eat. We have a well used game trail through the bottom of the yard that is beaten a foot deep. Moose travel that trail daily. The bear was on a path in the thick brush paralleling that trail, just off to the downwind side. I did see the cow moose the next day - still calfless - so he did not get her. Neither dog would settle - jumping up and barking all though the night at every little sound - they finally settled down the next morning. We stayed out of the yard till the next morning, also. When I did venture out, I kenneled the dogs and with shotgun in hand checked the birds. Then I went into the lower part of the yard to check, just in case the bear had killed the moose presenting another set of problems. We here at Fish and Game get half a dozen calls or so this time of year to come move bear killed moose out of yards as that is the only way to get the bear to move on. Bears are dangerous as they protect their kills. I am convinced now that Buddy would lay down his life for me, if it ever came to that. I don't want him going after bears, but his placing himself between me and the bear then ignoring me because I didn't know the danger impresses me. He made me think of the Nature program about our relationship with dogs and how the dogs helped man with their better sense of hearing and smell and, in return, man provided shelter and food. They work together. Buddy was my ears that day and my warning - I love him for that! Maggie Lindsey is a New Mexico transplant living in Alaska since 1983. She works for the Alaska Department of Fish and Game as the south-central hunter education coordinator where she coordinates and helps teach hunter ed, bow hunter ed, hunting clinics, Women In the Outdoors and coaches a youth sporting clays league. 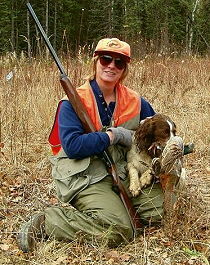 Hunting is her life - Maggie is an avid big game and bird hunter, pilot and fisher person. She has had hunting dogs since childhood - her first dog was an Irish setter that she bought and trained herself. 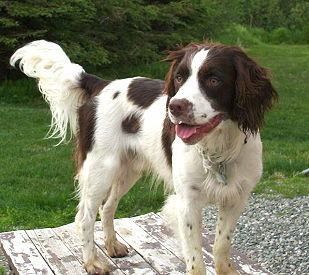 Now Maggie has springers, is a hunt test judge, runs in hunt tests and competes in the bird dog challenge. While other Alaskans are vacationing in Hawaii, Maggie spends two weeks in November hunting deer and pheasants with her husband, Keith, and wonder dogs, Scout and Buddy.